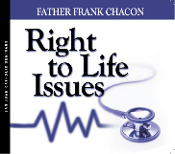 In a letter from the Bishops about Abortion, they state, "America is becoming comfortable with abortion. America is losing it's horror for abortion." The pope has also said, "we have become a culture of death... America, you are loosing your soul" and abortion is at the heart of this spiritual disease. These are strong words from our Vicar of Christ! Now with elections coming, we are faced with a decision. Will we make abortion just another political issue? Some voters would decide to vote for pro-abortion candidates, but would have never voted for a Nazi regardless of his welfare reform plan. They would have been horrified if he said it was okay to kill Jews. The attitude that abortion is okay in "some cases" or "women have the right to choose," this attitude proves we have lost our horror for abortion.